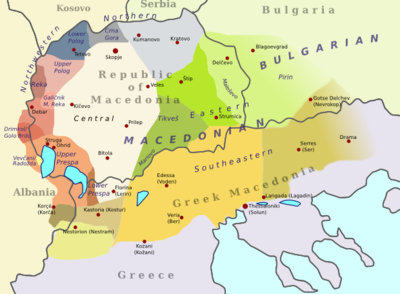 The dialects of Macedonian comprise the Slavic dialects spoken in the Republic of North Macedonia as well as some varieties spoken in the wider geographic region of Macedonia. They are part of the dialect continuum of South Slavic languages that joins the Macedonian language with Bulgarian to the east and Serbo-Croatian to the north. The precise delimitation between these languages is fleeting and controversial. Macedonian authors tend to treat all dialects spoken in the geographical region of Macedonia as Macedonian, including those spoken in the westernmost part of Bulgaria (so-called Pirin Macedonia), whereas Bulgarian authors treat all Macedonian dialects as part of the Bulgarian language. Prior to the codification of standard Macedonian in 1945, the dialects of Macedonia were for the most part classified as Bulgarian. In Greece, the identification of the dialects spoken by the local Slavophone minority with either Bulgarian or Macedonian is often avoided, and these dialects are instead described simply as "Slavic", Dopia ('Local'), Stariski (old) or Našinski (ours). Most linguists classify the dialects in the Pirin (Blagoevgrad) region of Bulgaria and in the far east of Greek Macedonia as Bulgarian and the dialects in the rest of Greece and in Republic of North Macedonia as Macedonian. As far as consonantal features are concerned, the entire Western region is distinguished from the East by loss of /x/ (except Tetovo, Gora and Korča) and the loss of /v/ in the intervocalic position (except Mala Reka and parts of Kostur-Korča): /ɡlava/ (head) = /ɡla/, /ɡlavi/ (heads) = /ɡlaj/. The Eastern region preserves /x/ (except Tikveš-Mariovo and Kumanovo-Kriva Palanka) and intervocalic /v/. The East is also characterised by the development of epenthetic /v/ before original /o/ where the West has epenthetic /j/: Eastern /vaɡlɛn/ (coal) but Western /jaɡlɛn/. The diphonemic reflexes are most characteristic of the dialects of Greek Macedonia and Blagoevgrad Province, Kostur-Korča and Ohrid-Prespa. The Serres – Nevrokop dialects have a series of phonemically palatalised consonants. The Western dialects generally have fixed stress, antepenultimate in the Republic of North Macedonia, and penultimate in Greece and Albania. The Eastern region, along with the neighbouring Bulgarian dialects, has various non-fixed stress systems. In Lower Vardar and Serres-Nevrokop unstressed /a, ɛ, ɔ/ are reduced (raised) to [ə, i, u]. The reduction of unstressed vowels (as well as the aforementioned allophonic palatalisation of consonants) is characteristic of East Bulgarian as opposed to West Bulgarian dialects, so these dialects are regarded by Bulgarian linguists as transitional between East and West Bulgarian. ^ Institute of Bulgarian Language (1978). Единството на българския език в миналото и днес (in Bulgarian). Sofia: Bulgarian Academy of Sciences. p. 4. OCLC 6430481. ^ Стойков (Stoykov), Стойко (2002) . Българска диалектология (Bulgarian dialectology) (in Bulgarian). София: Акад. изд. "Проф. Марин Дринов". ISBN 954-430-846-6. OCLC 53429452. ^ K. Sandfeld, Balkanfilologien (Copenhagen, 1926, MCMXXVI). ^ Академик Божидар видоески, Кичевскиот говор. МЈ, 1957, VIII, 1, стр. 31–90. ^ Македонските дијалекти во Егејска Македонија: (Обид за класификација). Македонските дијалекти во Егејска Македонија: научен собир, Скопје 23–24 декември 1991. Скопје: МАНУ, 1994, стр. 23–60. ^ Schmieger, R. 1998. "The Situation of the Macedonian Language in Greece: Sociolinguistic Analysis", International Journal of the Sociology of Language 131, 125–55.